Burrr!! Writing blog entries in this blissful Delhi Winter has been a task. Our last entry was a couple of weeks ago and it has been a relatively longer break. It's not like we have not been cooking and experimenting, but taking ones hands out of the quilt to type and process pictures has seemed like a task. But we have finally come over it and would be posting a few recipes in the next few days! Now back to food - This recipe is completely original. The genesis was again cooking something for a home party which included a very dear friend who is a voracious paneer eater - Priyanka Garg. Now most North Indians love to eat paneer but Priyanka is a different breed, what with her preference for paneer in dishes like rajma and daal !! So we needed to come up with something that would have loads of paneer. 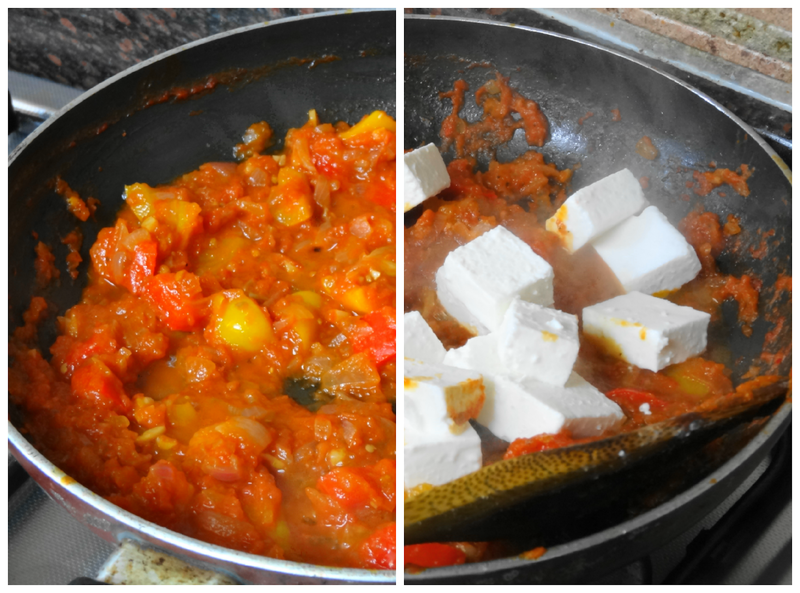 When we were thinking of which cuisine to make, we realized that we haven't yet cooked an Italian dishes with paneer. So this prompted us to try cooking a tomatoey dish with slight parmesan flavours. This has been one successful dish and we have made it for several occasions. Do try! 3. Add the grated tomatoes and the purée. Cook for about 10 minutes till most of the water evaporates. 6. Finally add the paneer and cook for another 5 minutes to coat the cubes nicely. You may want to add a bit of water if the mixture is too dry to cook and mix. But just a little since this is supposed to be served like a dry starter. 7. Add the parmesan cheese and mix well.